This offer includes our new arrival Blue Howlite Vampire Diaries style pendants. Last Day or whilst stocks last and can’t be used with any other offer or discount. 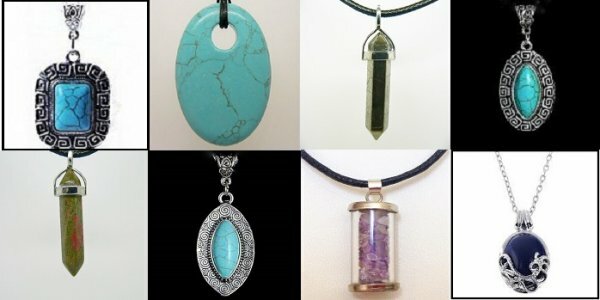 All crystal pendant ,embedded with scalar waves in the solfeggio healing frequencies that are on our web site, *with the exception of the Infinity and Ascension range, are included is this LUCKY DIP SALE. They are all pre-wrapped so we have no idea what we are picking out for you, but it will definitely be the one that is meant for you or the person you are gifting it to. Sorry we can’t fulfill requests for any crystals as this is a genuine LUCKY DIP SALE. Howlite is said to help with pain, insomnia, bones, osteoporosis, teeth, calcium levels, leg cramps, anxiety disorders and stress-related illnesses. Less well-known uses in crystal healing are for the circulatory system and endocrine system. This lucky dip offer includes a a range of our crystal pendants embedded with the solfeggio frequencies.